Do you Differentiate in your Spanish classes? Lesson ideas for Spanish teachers! 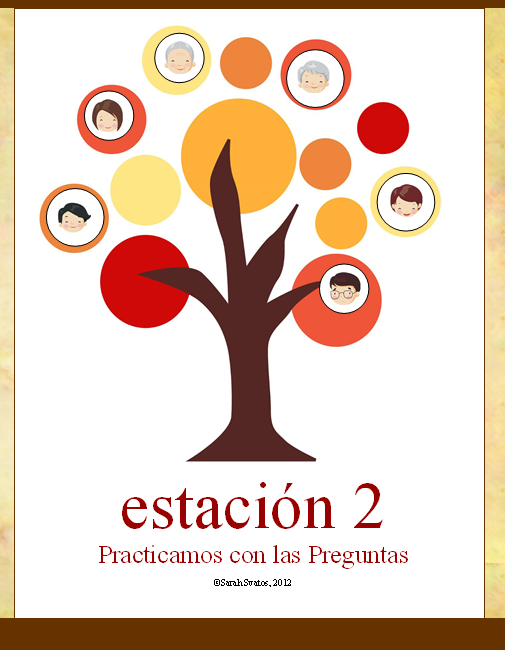 Differentiated Instruction has been a hot topic at teacher workshops and conferences for several years because it´s a great solution to teach the multiple levels of understanding that take place within each mix of students you have throughout the day. One way to add Differentiated Instruction to your Spanish lessons is to set up “Stations” for a particular topic or unit and allow students to work through the activities at their own pace. In an effort to add student options and help them learn responsibility for their own learning, I’ve created several units that can be used as Differentiated Instruction Stations. Stations are physical learning locations set up in your classroom. Each location focuses on a specific area (or modality) of learning. 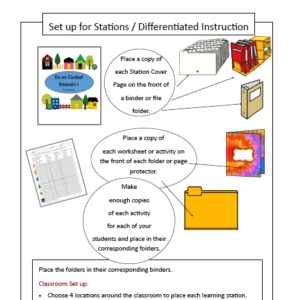 · Choose locations around the classroom to place each learning station. · Choose 1 teaching table. This is where you will sit, students will know they can approach you for individual instruction (any questions they might have) when you’re at this table. Students can also approach you here to check off their work so they can move on to the next task. · Group leftover desks in clusters around the classroom. Students will be able to go to any cluster to do their work. Students are given a checklist of activities that they are required to do and move from station to station to complete each task. Why does this work so well?? Because students can take charge of their own learning! “This was PERFECTO while I had a sub for 2 days! 1. Vocabulario – students learn the new vocabulary and do a variety of practice activities to familiarize themselves with their new family words and to help them memorize the new vocabulary. 2. Speaking & Listening – students practice using their new vocabulary aloud as they participate in Communicative Activities with a partner (or partners). 3. Reading & Comprehension – students practice their understanding by reading several texts and answering questions about what they have read. Students also read a story and retell the story cartoon style in speech bubbles. 4. Project Based Assessment – students choose a project to demonstrate their understanding of what they have learned. I’m so pleased that teachers across the U.S. are enjoying these Stations activities and letting me know! I hope you’ll head over to my TeachersPayTeachers store and take a look for yourself! Make sure to check out the free preview and take a look at everything included in this Stations packet. 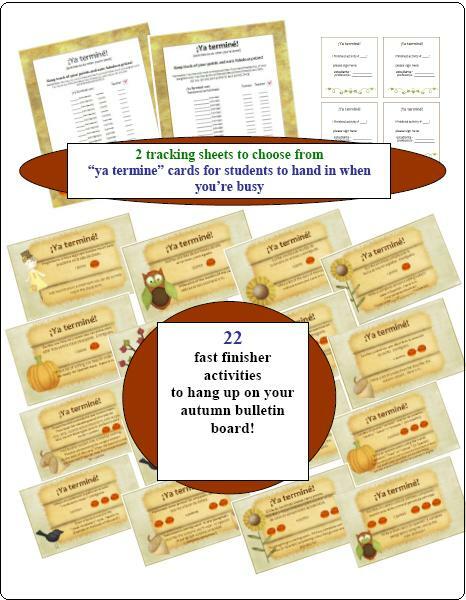 And if you do purchase and use this packet, I would LOVE to know how the activities worked out for you with your students!! 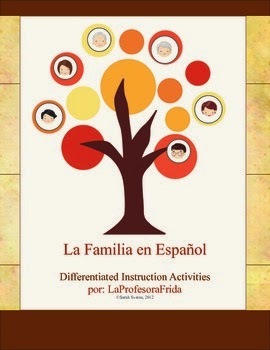 Read about La Profesora Frida’s “Around Town, In the City” Differentiated Instruction Stations Packet here! http://thestressfreespanishteacher.com/wp-content/uploads/2018/08/Eyes-and-Glasses-300x149.png 0 0 admin http://thestressfreespanishteacher.com/wp-content/uploads/2018/08/Eyes-and-Glasses-300x149.png admin2014-09-20 15:14:002017-08-29 11:54:32Do you Differentiate in your Spanish classes? Lesson ideas for Spanish teachers! FREE lesson for Spanish classes! But also great for Culture, Social Studies, History (and other Foreign Languages!)! Let’s dispel the myth of the “ignorant American” by allowing an opportunity for our students to study current events in other countries ON A REGULAR BASIS! Not just for a day or even just a week, but dare I say for an entire semester?? Or, GASP, an entire school YEAR?? 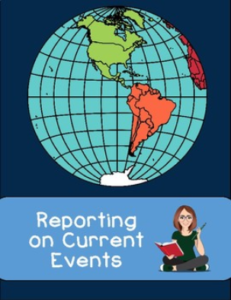 Current Event Articles are a fantastic way for students to take charge of their own education, learn to use multiple resources, and to research a place in the world that they find interesting. Depending on your classroom needs, this could be a weekly, monthly, semester or year long project for any class! This activity is perfectly suited for a government class, world history, social studies or foreign language classes. But I can see this research being done in so many different classes. It would be a wonderful activity for a speech/public speaking class too. Find this FREE lesson here! I wrote this document for use in my Spanish classes, but as you can see, it can easily be changed for any foreign language classroom, social studies, or government class. And being the creative teacher that YOU are, I’m sure you can think of many more applications! My students are having a blast this semester with this activity. They know that every Thursday their Current Event Article is due, and they get to share the articles they found for the week with their classmates. My students are not only keeping themselves and their classmates up to date on world news, they’re helping to keep ME informed as well! This is a FREE lesson you can download in my TeachersPayTeachers store! I really hope that you will also find it useful. Positive feedback MAKES MY DAY ~~ If you have a wonderful experience or anecdote about using this product in your class, please share it here!! http://thestressfreespanishteacher.com/wp-content/uploads/2018/08/Eyes-and-Glasses-300x149.png 0 0 admin http://thestressfreespanishteacher.com/wp-content/uploads/2018/08/Eyes-and-Glasses-300x149.png admin2014-09-19 17:47:002017-08-29 11:57:17FREE lesson for Spanish classes! But also great for Culture, Social Studies, History (and other Foreign Languages!)! 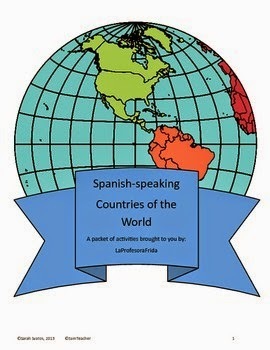 Spanish Speaking Countries of the World LESSONS made easy! 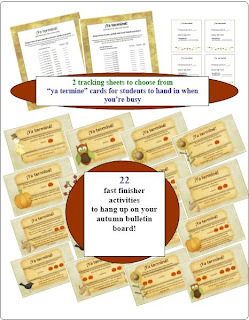 Maps, lists, printables, quizzes, puzzles, RESOURCES! 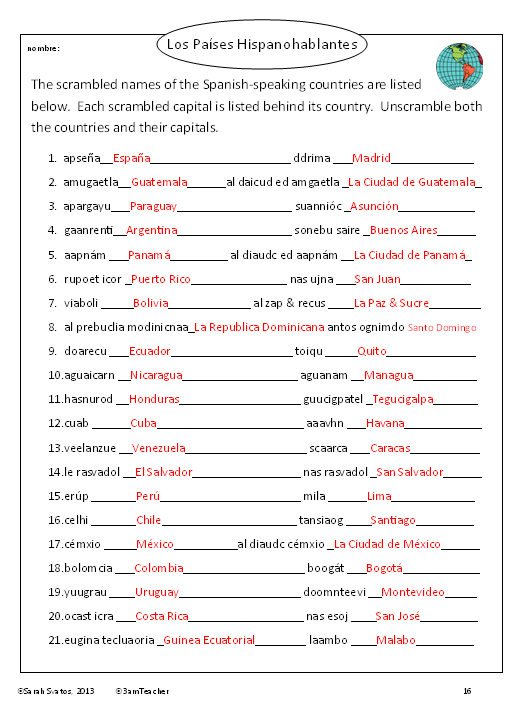 When do YOU teach the Spanish-speaking countries of the world (and capitals, of course!)? No really, I want to know!! 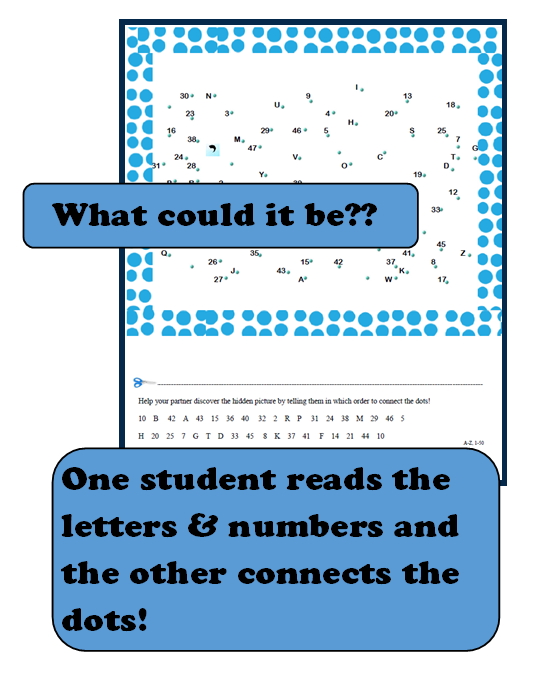 Please leave a comment below and let me know WHEN during the school year you teach this! I have ALWAYS taught Spanish Countries and Caps at the beginning of the school year. I think it’s good for our students to have a basic knowledge of where the Spanish-speaking countries ARE as they begin their Spanish study. Logical enough. Ever have one of those, “duh” moments? Yeah, me too. It didn’t occur to me until recently that I could be teaching this at ANY time of year. DUH. Of course I can! I can teach this WHENEVER I want and however I want. 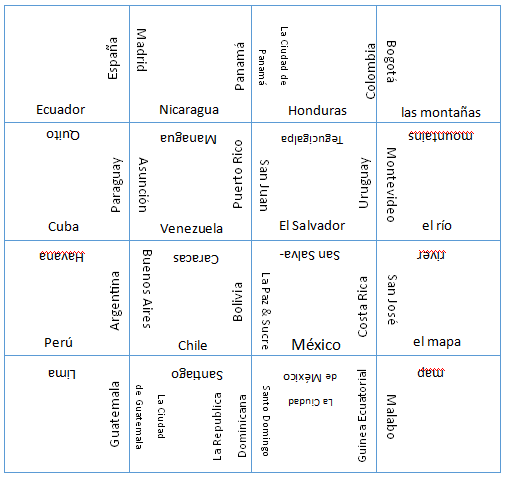 I’ve been considering teaching the Countries and Caps at the BEGINNING of the school year AND then revisiting it again SEVERAL TIMES throughout the year! My students are studying the night before for the quiz and then once they’ve taken the quiz …. they promptly FORGET everything they just learned. Hmmm… And why? Because they aren’t required to know this information the next day. 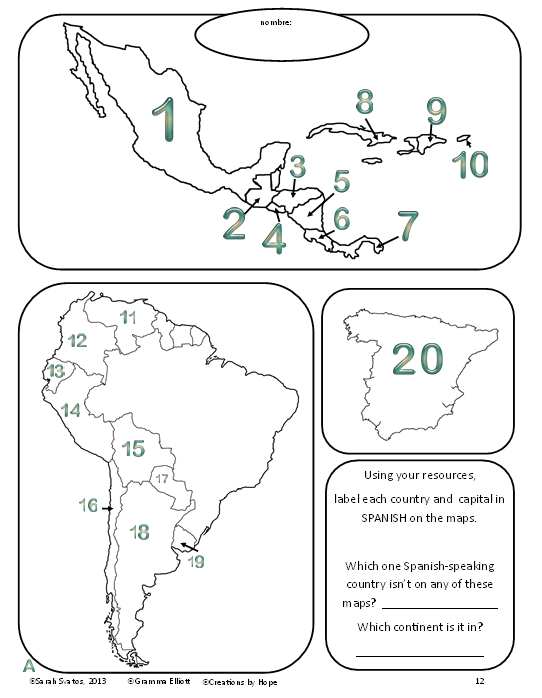 That’s why I put together this big packet of printables and resources: Spanish-Speaking Countries of the World. It’s got me covered for the entire school year! I will be using these not only as Spanish class HOMEWORK assignments, but also as FAST FINISHER activities, partner pair work and emergency substitute plans. And to help my students RETAIN this fundamental information, I will be QUIZZING them AGAIN throughout the school year! I’m thinking once every quarter is just about perfect. My hope is that when they are aware that they are expected to retain this information, they will be more likely to do it! Please comment below and let me know WHEN you teach the Spanis-speaking Countries and Caps during the school year! I’d love to know what everyone else does! http://thestressfreespanishteacher.com/wp-content/uploads/2018/08/Eyes-and-Glasses-300x149.png 0 0 admin http://thestressfreespanishteacher.com/wp-content/uploads/2018/08/Eyes-and-Glasses-300x149.png admin2014-09-17 18:22:002017-08-29 12:00:12Spanish Speaking Countries of the World LESSONS made easy! Maps, lists, printables, quizzes, puzzles, RESOURCES! 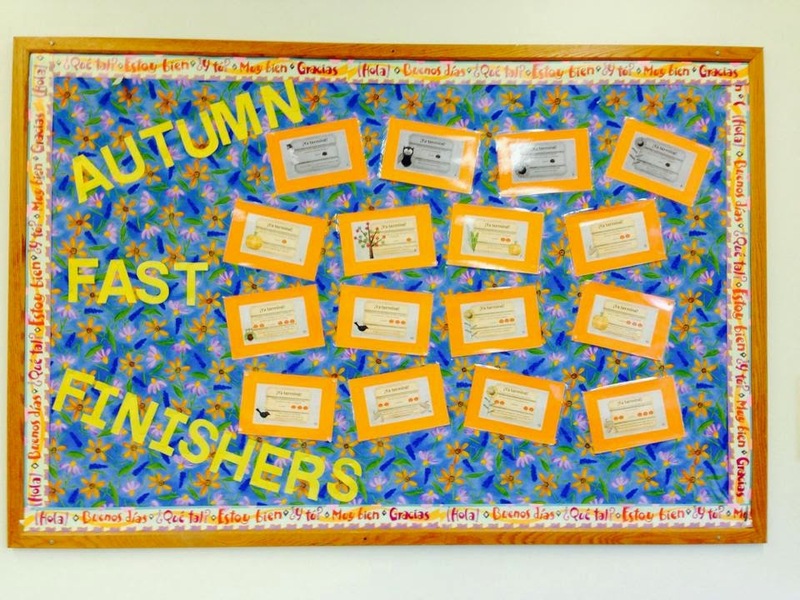 Spanish Class Fast Finishers, Autumn Style! Don’t you wish you could just point to your pretty bulletin board when you hear this question? 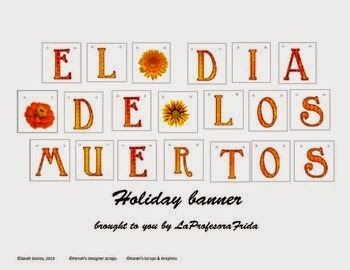 Spanish teacher, Laurie in New York’s awesome layout (above) with Autumn Fast Finishers for Spanish Packet from La Profesora Frida. 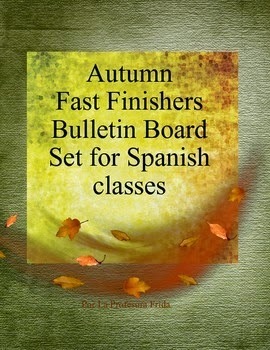 Already purchased La Profesora Frida’s Autumn Fast Finishers Bulletin Board Set? You could get the WINTER version for FREE by taking a picture of your bulletin board layout for the Autumn version and sending it to her on Facebook! The quiet type are those students who have a great work ethic. These are the students who already have a book to read or who have brought a bit of homework from another class to work on because they are used to finishing first. They’re nothing to worry about. Except…. Are they getting as much intellectual stimulation in your class as they deserve? The bored “trouble makers” are those students who are not actually trouble makers. They finish early because they are bright students, but then they don’t know what to do with themselves. They might start to wander the classroom or try to talk to students who are still trying to work– making them appear as though they are trouble makers. And…. Are they getting as much intellectual stimulation in your class as they deserve? One useful way to keep Fast Finishers academically focused (whether they realize it or not!) 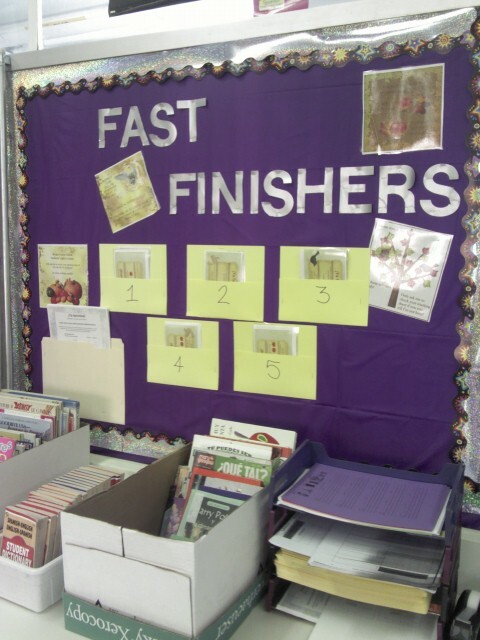 is to apply a Fast Finishers program to your classes. 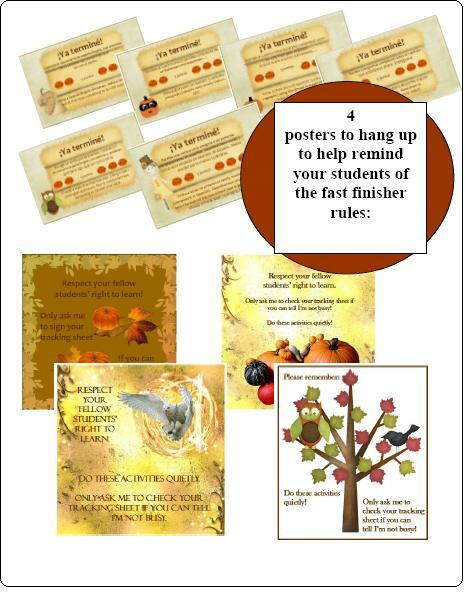 I have an Autumn Fast Finishers bulletin board in my classroom and the idea is to have a number of activities available for students to work on when they’re done with their regular work. 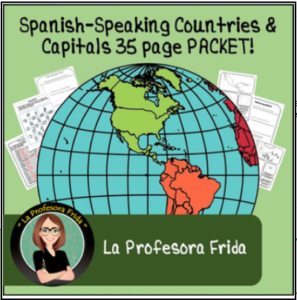 Check out this interactive, creative Spanish packet at my TeachersPayTeachers store! Let me know what you think! 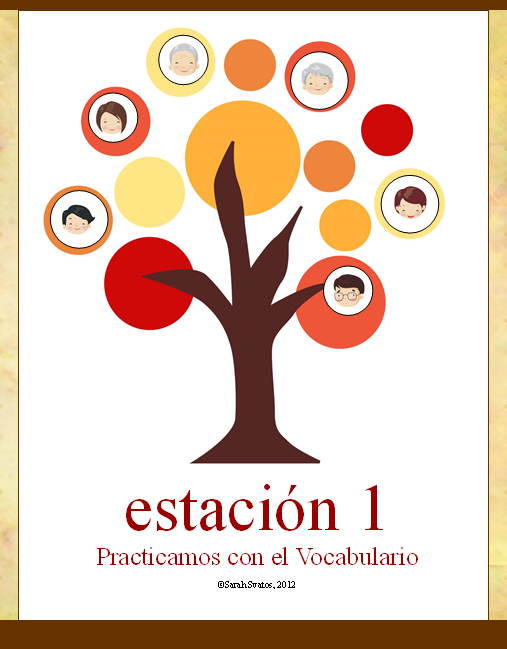 I find it incredibly useful, and I hope that you can apply this teaching concept to your Spanish classes as well. http://thestressfreespanishteacher.com/wp-content/uploads/2018/08/Eyes-and-Glasses-300x149.png 0 0 admin http://thestressfreespanishteacher.com/wp-content/uploads/2018/08/Eyes-and-Glasses-300x149.png admin2014-09-10 08:25:002014-09-10 08:25:00Spanish Class Fast Finishers, Autumn Style!